Cost range from $85.00 to $110.00 depending upon copyright, licensing and arranging fees. HERE to see a DISC PLAYER music box IN ACTION. Click HERE to see our DISC PLAYER music boxes. We can custom make a disc of your own original tune or a licensed/copyrighted tune to play in a disc player. The discs will play a tune that is about 26 seconds long. If you don't already own a DISC PLAYER music box, you can purchase one from us. There is a large library of discs available that can play on these players. Not only would you have your own song but the ability to own all the other discs as well. We can make just one disc - there is no minimum. We would need either sheet music, or a media file (midi, etc). We would need you to clearly indicate 22-24 seconds of music to be used for the disc. The music on the disc will follow the music provided as closely as possible, and normally will not include any additional notes or embellishments. A musical arrangement is needed. For a custom disc with no supplied music, the cost could be close to $120.00 (includes arrangement fee). If the music needs licensing (if it is a published tune), we could apply for licensing but there could be an additional charge of $30.00 or more depending on the publisher. We would send you a quote before proceeding. We offer turnaround time of approximately 2 weeks. Place your order by clicking "add to cart" below. Once we start work on your order, we would need a 50% deposit. You will receive a sample sound by email and will have to authorize for us to proceed. 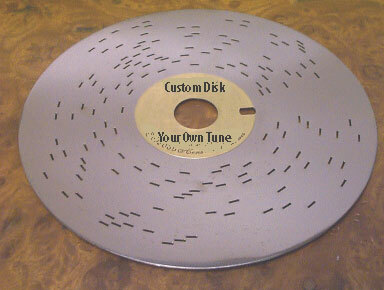 After approval, it would take approximately 2 weeks for us to send you a completed, one of a kind, custom musical DISC. The remainder will be charged when we ship. If the song you wish to put in your custom music box is your own composition, you need only send us a simple fax or letter with a short statement saying you are the author of the work, that we have your permission, and your signature. If the song you wish to use was written by someone else, such as a popular tune played on the air, we will need to obtain permission from the publisher to mechanically reproduce it as a music box disk. This permission is called a synchronization (aka merchandising or novelty) rights license. To obtain this license, We will contact the publisher (or author in some cases) to get that signed permission. We make a quick search of the three major performing rights organizations to see which one handles that song, do a song search for the contact info for that artist/publisher on their website, and contact the artist/publisher for permission. Depending on the tune, the publisher and time spent on legal issues, there would be an additional charge. Occasionally there may be an additional licensing fee and we will notify you before we proceed. If you have the permission, then just fax a signed copy to us.